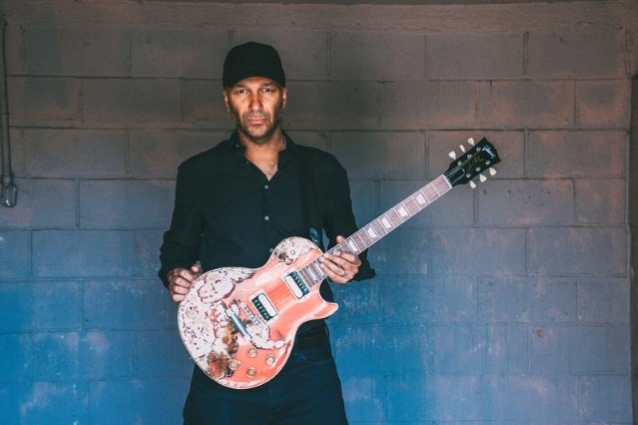 Asked by NME in a new interview how he rates Trump's performance during his first two years in office, the RAGE AGAINST THE MACHINE and PROPHETS OF RAGE guitarist said: "While Trump is an abomination, I think it's important not to look at him independent of the system that produced him. And it was years of these neoliberal policies that were supported by Clinton and Bush and Obama and the other Bush that caused the working class to really suffer. And they sent their kids overseas to fight in ridiculous, immoral wars. "I come from Trump country — the small town in Illinois where I come from, Democrats don't even run," he continued. "And the options [available] to people are [either] you join the army, you work at Walmart [or] you sell meth. And they looked at a broken system, and Trump provided some of the easiest answers, which is it's the Mexicans' fault, it's the Muslims' fault — that sort of racist way of dividing and conquering the working class that has had success before and certainly has had success with this demagogue." According to Morello, Trump's a culture of corruption, falsehood and demagoguery shouldn't blind us to the importance of speaking out at the ballot box or marching on the streets. "It's one more reason why people should not be silent in their vocations," he said. "There's the standard operating procedure of the parties, of the newspapers, of the talking heads in the media, and then there's this wildcard Trump who is raging against the machine in a way that is attractive simply because it stands in stark contrast to this spoonfed version of history and society that you get. "It's very important, if you have an outsider view that differs from that, like I do, I think it's crucially important, whether you're a journalist, whether you're a cameraman, whatever your occupation is, to not leave your convictions behind in your vocation and to enter that debate," he added. "We all have a megaphone of different sizes to speak up." Asked how he thinks important poliical change will come about, Morello said: "I don't think it's gonna be one voice — I'm not sort of waiting for a Messiah. The way that change has happened in my country, progressive, radical and even revolutionary change has always come from below — always come from below. Whether it's women getting a right to vote or desegregating lunch counters, or even globally, whether it was the dismantlement of the Berlin Wall of the end of apartheid, those things happened because people no different from the people watching this or reading this — people with no more power, no more courage, no more intellect than you out there — stood up in their time to change the world. That's how the world changes." Morello's new solo LP, titled "The Atlas Underground", was released on October 12.